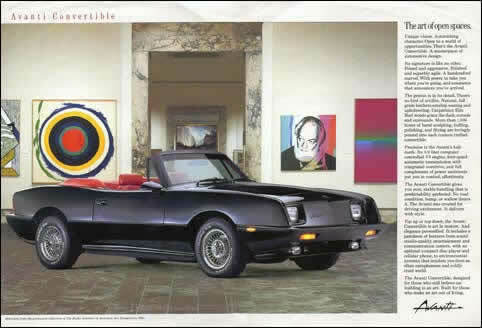 provided a unique setting for photographing the late 80s Avanti convertible surrounded by the gallery's collection of modern art. 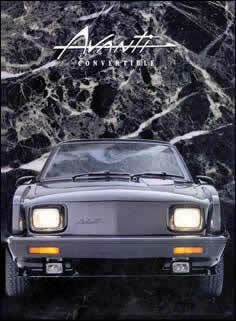 Promotion of a Late 1980s Post-Studebaker Avanti - Unique vision. Astonishing character. Open to a world of opportunities. That's the Avanti Convertible. 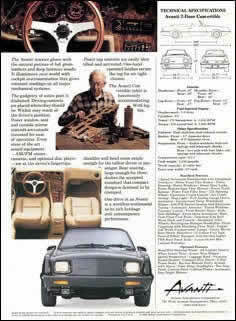 A masterpiece of automotive design. Its signature is like no other. Poised and aggressive. Polished and superbly agile. A handcrafted marvel. With power to take you where you're going, and assurance that announces you've arrived. The genius is in its detail. There's no hint of artifice. Natural, full grain leathers envelop seating and upholstering. Carpathian Elm Burl woods grace the dash, console and surrounds. Precision is the Avanti's hallmark. Its 5.0 liter computer controlled V8 engine, four-speed automatic transmission with integrated overdrive, and full compliment of power assistants put you in control, effortlessly. Top up or top down, the Avanti Convertible is art in motion. And elegance personified. It includes a pantheon of features from sound studio-quality entertainment and communication centers, with an optional compact disc player and cellular phone, to environmental systems that insulate you from an often cacophonous world. The Avanti Convertible, designed for those who still believe car building is an art. Built for those who make an art out of living. An Avanti convertible photographed inside the Butler Institute of American Art. The Butler Institute brochure cover. A Butler Institute brochure page.